William P. Hankowsky has served as a trustee of the trust since May 2003. Mr. Hankowsky joined the company on January 1, 2001, as Executive Vice President and Chief Investment Officer and was promoted to the position of President on March 12, 2002. Mr. Hankowsky became the Chief Executive Officer of the trust on January 21, 2003, and Chairman on June 10, 2003. Prior to joining the trust, Mr. Hankowsky served as President of the Philadelphia Industrial Development Corporation ("PIDC") from 1989 through 2000. As the Chief Executive Officer of PIDC, he oversaw the City of Philadelphia's economic development agency. Prior to that time, Mr. Hankowsky served as an executive with a variety of economic development projects and agencies. Mr. Hankowsky currently serves on the boards of Aqua America, Inc., Citizens Financial Group and a variety of not-for-profit entities. Thomas C. DeLoach, Jr. has served as a trustee of the trust since May 1999. Mr. DeLoach served as an Executive Vice President of Mobil Oil Corporation and the President of Global Midstream, both wholly owned subsidiaries of Mobil Corporation (now Exxon Mobil Corporation), a global energy company, prior to his retirement in March 2000. Mr. DeLoach joined Mobil Corporation in 1969 as a chemical engineer and advanced through various positions in manufacturing, marketing, planning, and supply. From December 1994 until his election as President of Global Midstream, Mr. DeLoach served as Chief Financial Officer and Senior Vice President of Mobil Corporation and Mobil Oil Corporation. From 1991 until his retirement in 2000, Mr. DeLoach served as a director of Mobil Oil Corporation. Mr. DeLoach was a partner in Penske Racing, LLC from 2000 until 2002 and has been the managing partner of PIT Instruction & Training, LLC since 2003 and Red Horse Racing II, LLC since 2005. Mr. DeLoach is also a member of the board of directors of Asbury Automotive Group (NYSE:ABG). Katherine E. Dietze (Wendy) joined Liberty's board of trustees in January 2011. Ms. Dietze was Global Chief Operating Officer, Investment Banking Division of Credit Suisse First Boston, a financial services company, until her retirement in 2005. She had also held the position of Managing Director, Investment Banking. Prior to joining Credit Suisse First Boston, Ms. Dietze was a Managing Director for Salomon Brothers Inc, a financial services company. Ms. Dietze brings a strong background in global investment and financial matters. Ms. Dietz serves on the boards of Cowen Group (Nasdaq: COWN) and Matthews International Corporation (Nasdaq: MATW). Antonio Fernandez joined Liberty Property Trust's board of trustees in November 2014. Mr. Fernandez is President of AFF Advisor, LLC. He previously served as Executive Vice President and Chief Supply Chain Officer at Pinnacle Foods, Inc. (NYSE:PF). At Pinnacle, Mr. Fernandez had overall corporate responsibility for the end-to-end supply chain, including procurement, manufacturing, customer service, warehousing, and distribution. He also oversaw Pinnacle's food quality and safety programs. Prior to joining Pinnacle in 2011, Mr. Fernandez was Senior Vice President Global Supply Chain Strategy at Kraft Foods Inc., following the acquisition of Cadbury, plc. Mr. Fernandez was with Cadbury from 1998 to 2010 in a series of senior management positions, including Chief Supply Chain Officer. Mr. Fernandez's early career included positions in manufacturing, procurement, engineering and consulting with Procter & Gamble Co., and PepsiCo, Inc. Mr. Fernandez serves on the board of trustees of Lafayette College. Daniel P. Garton has served as a trustee of the trust since December 2001. Prior to his retirement in January 2014, Mr. Garton served as President and Chief Executive Officer of American Eagle Airlines, one of the world’s largest regional airlines, beginning in June 2010. AMR Corporation is the parent company of American Eagle and American Airlines. Prior to joining American Eagle, Mr. Garton served as Executive Vice President-Marketing of AMR Corporation’s American Airlines unit. In that position, Mr. Garton oversaw American Airlines’ activities with respect to reservations, flight service, sales, its travel awards program, advertising and corporate communications. Previously, Mr. Garton served as Senior Vice President and then Executive Vice President of American Airlines Customer Service beginning September 1998. Mr. Garton served as President of American Eagle Airlines for three-years beginning in July 1995. Mr. Garton serves as a director on the boards of Republic Airways and Triumph Group. Mr. Gifford brings over 30 years of leadership experience in real estate investment, development and asset management to the board. He joined AIG Global Real Estate Investment Corporation as president and CEO in the aftermath of the financial crisis, and in that role from 2009 to 2016 was responsible for first stabilizing and restructuring, and then rebuilding the company's sizeable real estate platform. Prior to this, Mr. Gifford's 22-year career at AEW Capital Management included leadership roles in investments, capital markets and portfolio management. Mr. Gifford serves on the boards of Retail Properties of America, Inc. (NYSE:RPAI) and Lehman Brothers Holdings, Inc., and on the advisory boards of Aspen Heights Partners and Collier Enterprises. He is a full member and former council vice-chair of the Urban Land Institute. David L. Lingerfelt has served as a trustee of the trust since May 1995. Mr. Lingerfelt is partner in the law firm of Setliff & Holland and was previously shareholder in the firm of Parker, Pollard, Wilton, and Peaden, PC. Until 2008, Mr. Lingerfelt was Vice President and Commercial Counsel for the exchange subsidiary of the LandAmerica Financial Group and Director of its Reverse Exchange Division. Prior to joining LandAmerica, Mr. Lingerfelt served as Director of Property Administration and Counsel for Best Products Co., Inc., and was a partner in the Virginia law firm of Coates Davenport. Marguerite Nader has served as a trustee of the trust since June 2017. Ms. Nader is President and Chief Executive Officer of Equity LifeStyle Properties, Inc. (NYSE: ELS), and has served on their board of directors since 2013. She joined Equity LifeStyle Properties in 1993 and has held various positions in asset management, new business development, and marketing. Prior to being appointed Chief Executive Officer, she served as President and Chief Financial Officer. Ms. Nader has served on the National Association of Real Estate Investment Trusts ("NAREIT") Board of Governors since 2013. Lawrence D. Raiman joined Liberty Property Trust’s board of trustees in April 2019. Mr. Raiman is Managing Principal, Chief Executive Officer and Portfolio Manager of LDR Capital Management, an asset management firm that manages a number of strategies focused on real estate and preferred securities on behalf of institutions and high net worth investors. Before founding LDR Capital Management in 2011, Mr. Raiman was Managing Director at Credit Suisse Group, and also ran the firm’s Global Real Estate Securities business, managing $2.6 billion on behalf of investors. Prior to this he was the head of real estate and REIT research at Credit Suisse, and earlier in his career, Mr. Raiman was a top-rated REIT industry analyst with Donaldson, Lufkin & Jenrette and PaineWebber. He is a certified public accountant and a member of the National Association of Real Estate Investment Trusts, the International Council of Shopping Centers, and the Urban Land Institute. Fredric J. Tomczyk joined Liberty Property Trust’s board of trustees in November 2014. Prior to his retirement in 2016, Mr. Tomczyk was President and Chief Executive Officer of TD Ameritrade Holding Corporation (NYSE: AMTD). He had served as President and Chief Executive Officer of the TD Ameritrade Holding Corporation since October 2008. 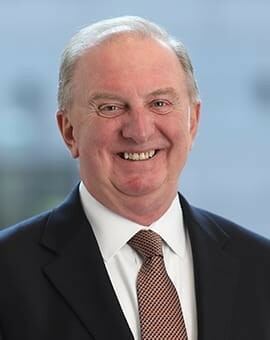 He previously served as a member of the company’s board of directors from January 2006 until June 2007, when he accepted the role of Chief Operating Officer at the company, responsible for all operations, technology, retail sales functions and the independent registered investment advisor channel. He remained in that role until he became President and Chief Executive Officer and re-joined the board of directors in October 2008. Mr. Tomczyk previously served as the Vice Chair of Corporate Operations for TD Bank Group (“TD”), as Executive Vice President of Retail Distribution for TD Canada Trust (a wholly-owned subsidiary of TD), and as Executive Vice President and later as President and Chief Executive Officer of Wealth Management for TD Bank. Prior to joining TD Bank in 1999, he was President and Chief Executive Officer of London Life.